Affiknitty -: An FO, and a Contest! Scroll down to find out how to do some good for others while getting a chance to win some Malabrigo. I can't say enough good things about this yarn and this pattern. First the Malabrigo Sock yarn: This was the first pair of socks I've knit with Malabrigo. Like all the other Malabrigo yarns, it is extremely soft. While knitting, it seemed even more fine than other sock yarn, more like a lace yarn. Yet, it was easy to knit with and seemed to hold up well when I had to undo and reknit a couple of mistakes. I picked up this skein (and more) at K2TOG, in Albany, CA. They had just received a shipment from Malabrigo, so I was able to view a good sampling of the colors available. Just as the softness of the Sock yarn is true to what you are used to if you've knit with Malabrigo worsted, so are the beautiful, saturated colors. The color didn't bleed at all when I washed the socks, and they blocked nicely. The pattern: If you like to knit socks, but haven't knit Priscilla's Dream Socks yet, I recommend that you try it. 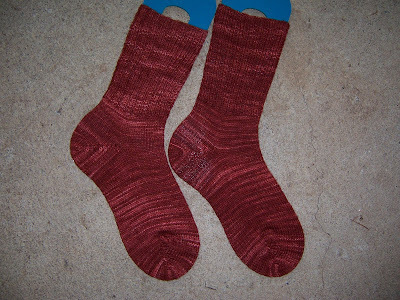 Priscilla Gibson-Roberts studied sock designs and techniques from all over the world, and then came up with this pattern, with short-row heels and toes, as the best fitting socks she could create. She also created a chart of numbers to plug into the pattern, based on foot circumference and yarn gauge, so you can follow her pattern for your foot, and whatever yarn you want to use, and end up with a perfectly fitting pair of socks. American Red Cross International Response Fund: There are incredible needs just for food, water, and shelter. The American Red Cross partners with the Haitian Red Cross, and will work to provide for these basic needs. Doctors Without Borders: Overwhelming numbers of people need immediate medical attention. Doctors Without Borders is bringing in medical staff and supplies, as well as setting up a field hospital. Heifer International: This organization is not a traditional first responder, but they already work in Haiti, and will help people rebuild their lives following the disaster relief. Donate to the Haiti earthquake relief effort and get a chance to win some Malabrigo yarn. It's as simple as that! Step 1: Donate to one of the above organizations by next Friday, January 22nd. Step 2: Leave me a comment letting me know which organization received your donation. You do not have to say the amount. If you already donated before seeing this contest, and/or if you have a different favorite charity that is also working in Haiti, you can let me know about that too, and I will include you in the contest. 2) Two skeins of Malabrigo Worsted in color 247 Whales Road, enough for a beautiful scarf. 3) Two skeins of Malabrigo Chunky in color 23 Pagoda. Here is Ravelry link to a list of patterns that can be made with just 208 yards of bulky yarn. Shannon! I just want to let you know how much I love reading your blog :)I miss you my knitting friend. Thank you for this post. I just got through reading Yarn Harlot's post too. Knitters unite! I'm donating to The Red Cross effort, but please don't include me in the drawing. Should we post a comment on Yarn Harlot to get some traffic? BTW - I miss you all too! I donated to Americares. They are an organization that arranges international transport of donated medical supplies - much in the same way that Second Harvest works to stock food pantries in the US. We donated to Doctors Without Borders. Saw your post in Mal Junkies. Nice blog. PS: you made me want to make those socks! Thanks to everyone who has commented so far! I am adding a comment for Jenny, who left me a message on Ravelry that she gave to Doctors Without Borders. I donated to MSF x 2 last week. Such devastation. They need help. Doctors Without Borders - via donation, and via Ysolda, who is donating 80% of the proceeds from her sales. I donated to MSF (through the mail, so it probably hasn't gotten to them yet). I have donated to the Red Cross and also have donated an item to the Craft Hope etsy site that is benefiting Doctors Without Borders. I have a high school friend who is one of the Doctors in this wonderful organization. Shannon here, adding one last name to the list of names to draw for prizes-- Lisa emailed me about her donation.